Area X-9 is the ninth course of Secret Storage and the one hundred second course overall in Mario vs. Donkey Kong: Mini-Land Mayhem!. The Mini Marios all begin between the bottom left and the bottom center, with the exit door near the top right. In order to reach it, they must simply be guided via a series of Long Springs, Green Pipes, and Cannons to it while avoiding Piranha Plants and a Snifit. The M-Token is located near the middle right, suspended above a Spike Trap and below a Cannon. To collect it, the Mini Marios must bounce off of the next closest Long Spring from the left while headed right. The Mini Mario Card is located near the middle right, just below the exit door. 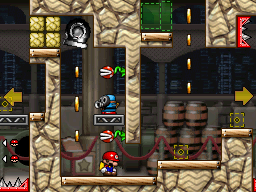 The Mini Marios must fire diagonally from the Cannon near the M-Token and bounce off the Long Spring to reach it. In order to earn a trophy, the player must score 17800 points. In Plus Mode, the Mini Peach must be guided to the exit door first, followed by the Mini Donkey Kong and then the Mini Pauline. In order to earn a trophy, the player must score 16000 points.